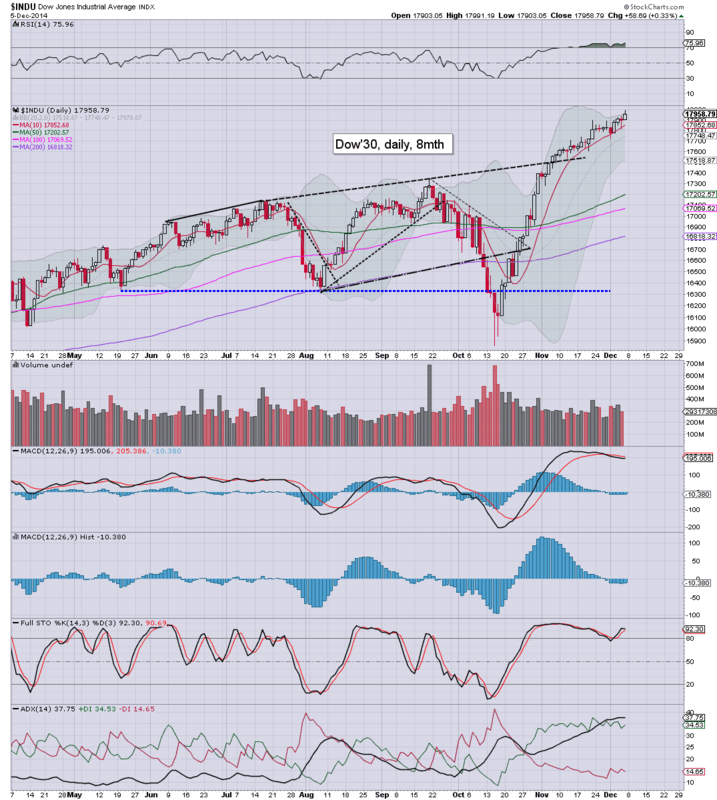 The broader upward trend continues, with regular new historic highs in some indexes. November net changes ranged from +5.1% (Trans), +2.5% (Dow), to u/c (R2K). 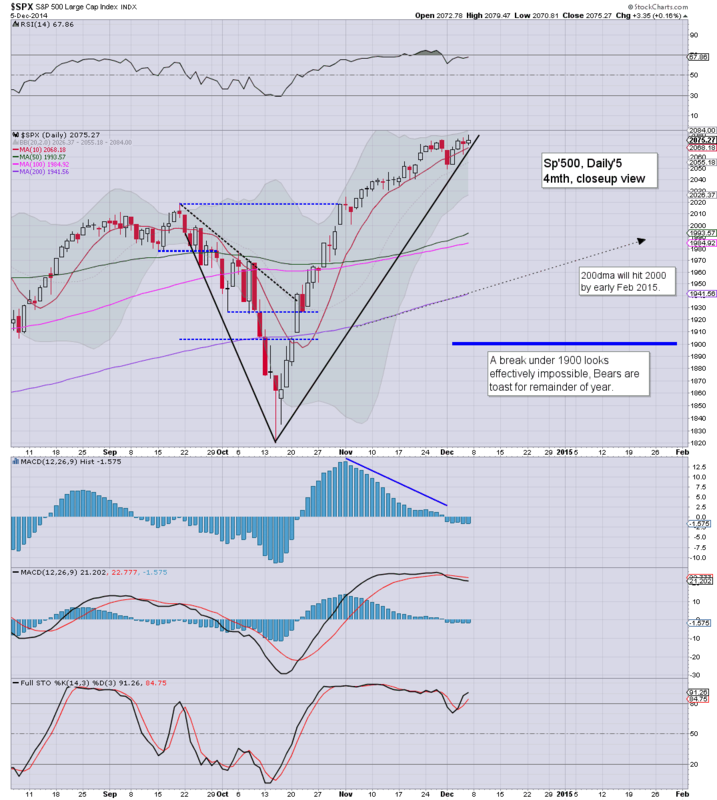 Outlook is broadly bullish into late 2015 to much higher levels. A Nov' gain of 2.4%, and with a new historic high of 2079 this past Friday, the 2100s are well within range before year end. Underlying MACD (blue bar histogram) is currently a little lower than for November. The mid Oct' low of 1820 now looks an extremely long way down, and even a brief break under the giant 2000 threshold looks increasingly difficult. The current yearly rate of increase is around 300pts... with the 2400/500s VERY viable by end 2015. Considering the possibility of the ECB doing its own QE-pomo program next year.. along with the BoJ 'buying EVERYTHING'... I'd not be surprised to see an acceleration in the current paper bubble. After the key golden fib' level of 2138... the next level is not until the giant 3k threshold, and frankly.. that looks likely, and whether late 2015 or early 2016, should make little difference to those on the long side. 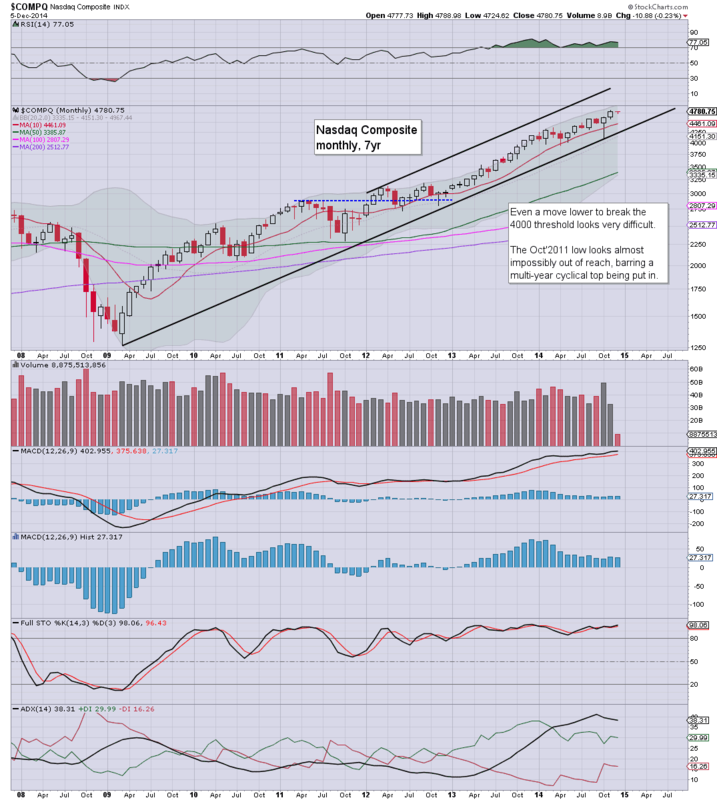 The tech' gained a very significant 3.5% in Nov' and with the Friday close of 4780, the Nasdaq Comp' is just 352pts (7.4%) away from the March' 2000 bubble high. 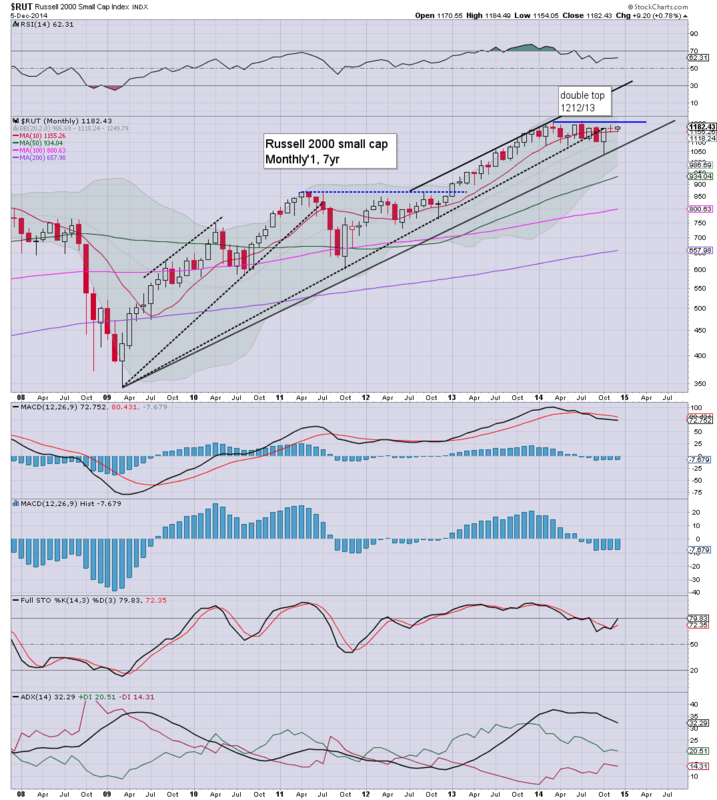 Considering the broader equity market, once we see a monthly close in the 5200s... the door is open to a hyper move to 6-7k.. before everything blows up again. The mighty Dow gained 2.5% in Nov', and with a new historic high of 17991 this past Friday, the trend remains outright super bullish. The 18k threshold looks set to be broken next week. Whether a retrace from there... is arguably of little consequence. The giant 20k threshold looks due by late spring/early summer 2015... and then its a case of whether the market accelerates on increased ECB/BoJ paper printing... or merely holds within the current upward trend. The master index clawed higher by 1.0% in Nov', and despite the broader market, remains somewhat stuck.. just under the 11k threshold. 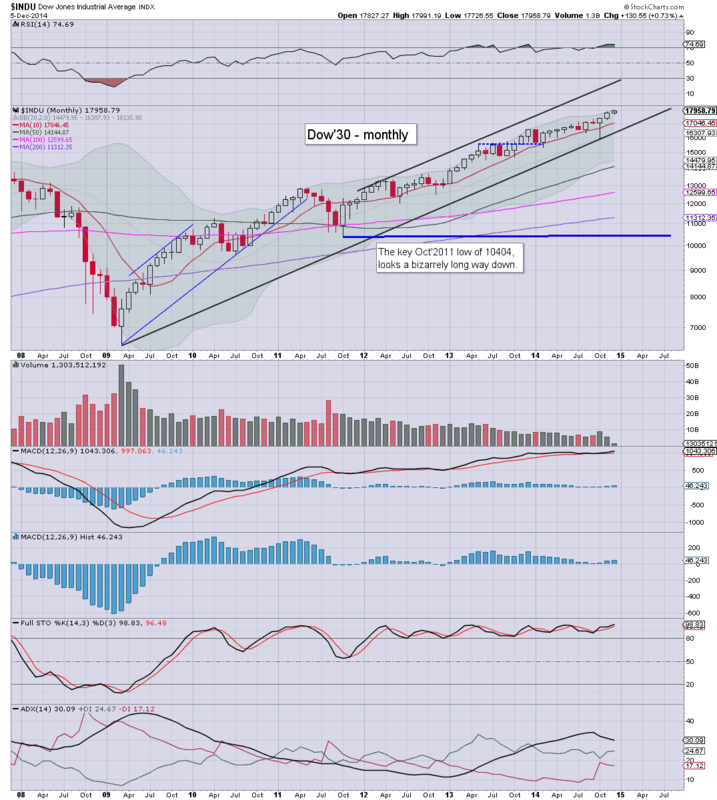 The upper bol' is offering the 11500s in the immediate term, but that looks unlikely until Jan/Feb. The R2K was flat for November, and as many have noted (not least on the bearish side of the fence), the R2K is still battling to break the double top of 1212/13. However, considering the recent US econ-data, and the broader market, the R2K looks set to put in a monthly close >1220 early next year. The 'old leader' saw a very powerful Nov' gain of 5.1%, no doubt largely due to the huge decline in Oil prices. There is viable year end upside to the 9400/500 zone, especially if Oil prices continue to be pressured by the strong dollar. The November gains were important follow through for the US equity market - confirming the spike-floor monthly candles, and we've already seen new historic highs of Dow 17991 and sp'2079. The broader trend remains unquestionably bullish. 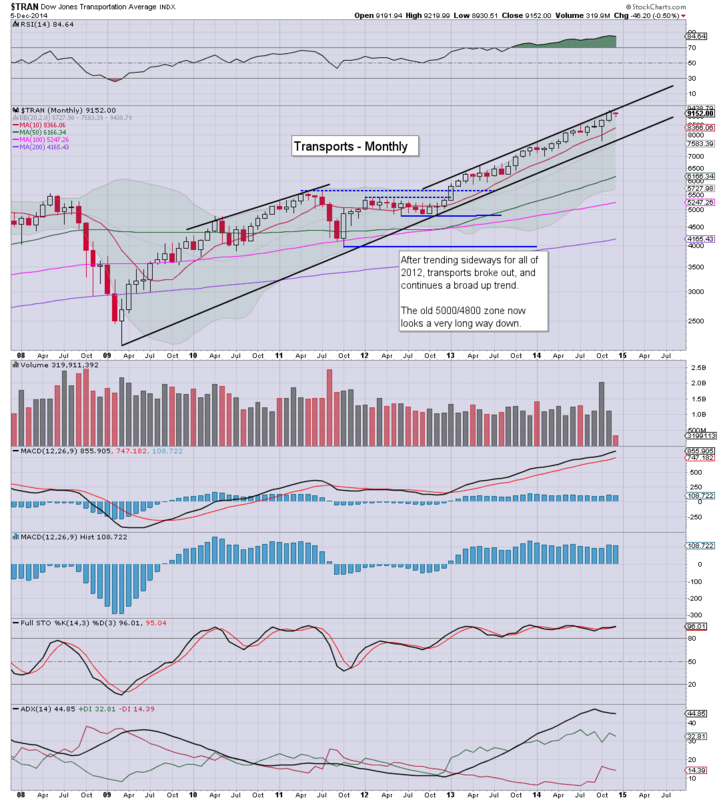 All that is missing is for the Trans to break into the mid 9000s, along with R2K breaking the summer high of 1213. With econ-data generally 'reasonable', the US economy looks set to put in good Q4 and Q1 earnings, which will be significantly boosted by efficiency gains via lower oil prices. A very quiet week is ahead. F - PPI, consumer sentiment. *Fed official Lockhart is scheduled to speak on Monday. Audio update from that guy with the weird accent. With the monthly jobs data coming in good, the USD continued to gain strength, with a new five year high of 89.50, breaking the March' 2009 high of 89.11. Next target is the Nov' 2005 high of 92.33. The giant 100 level is now a viable target for 2015. So.. the March' 2009 high has been decisively busted... and now its a case of where the USD settles at year end. On any 'fair' outlook, the Euro and Yen look set to weaken across the next few years. Even if the Fed do QE4... it will probably not be enough to turn the market in favour of Euro/Yen. 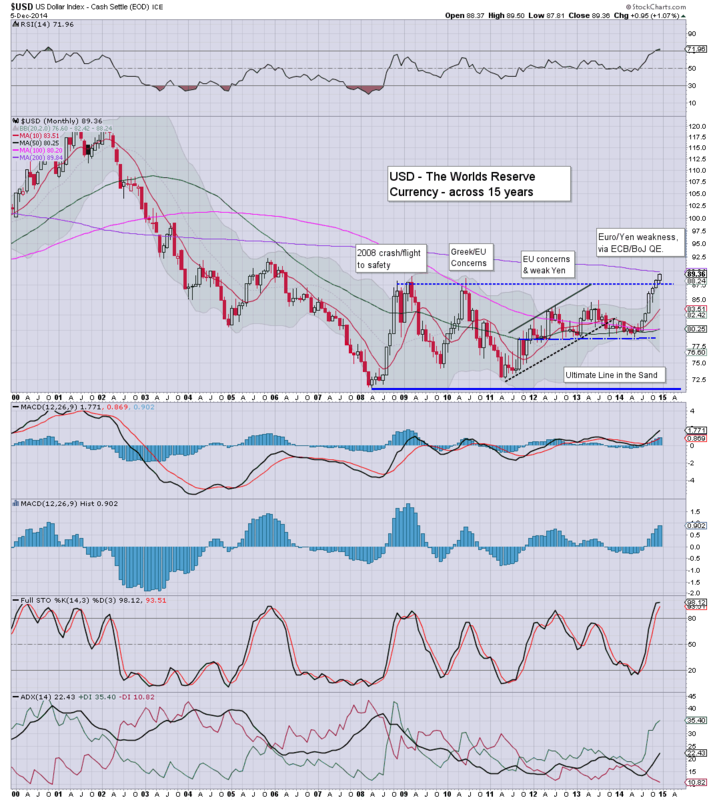 I'm bullish dollar at least for ALL of 2015...if not another 3-4yrs. .. and that will conclude another week. 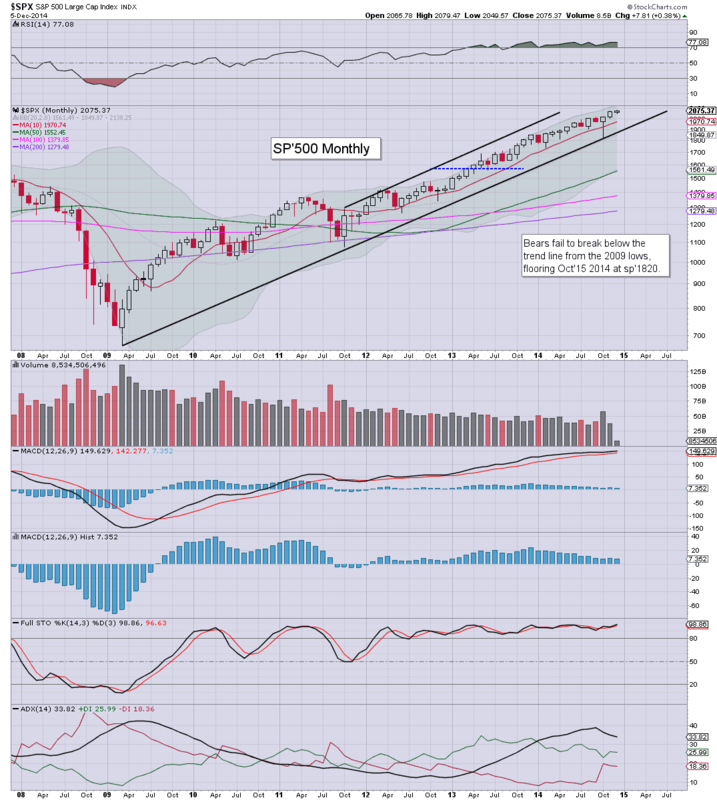 *the weekend post will be on the US monthly indexes. I'll very likely also add a podcast via Youtube. US equity indexes managed further gains, with new historic highs of Dow 17991, and sp'2079. 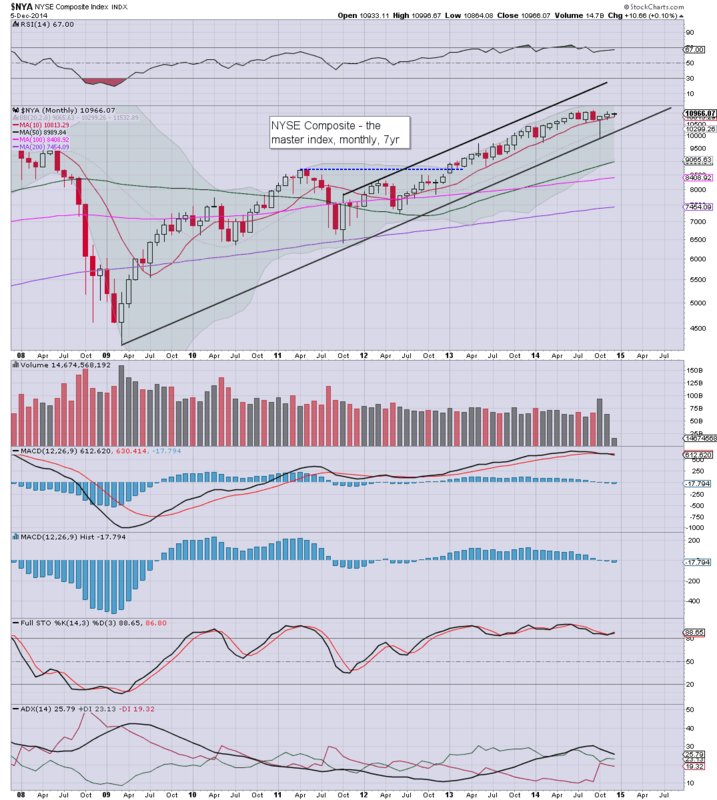 Near term outlook offers Dow 18000s, along with sp'2100s.. before the next realistic chance of a 3-6% retrace. Suffice to say, with new historic highs... there is nothing for the equity bears to get remotely excited about. Yes, the two leaders - Trans/R2K, are yet to confirm, but it'd seem they will, given another month... or two.